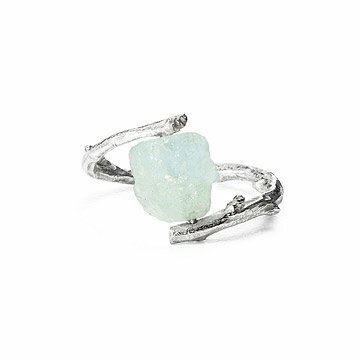 A rough-hewn aquamarine stone is entwined in a silver ring hand-cast from a coiled twig. This is an enchanted ring. Its sterling silver band is cast by jewelry artist Nancy Nelson from a handcrafted mold made from green twig found in the ancient woods of West Virginia. Rather than the hard formality of a cut stone, it holds a rough-hewn nugget of aquamarine. A gemstone long believed to promote good luck and harmony, it seems to have an otherworldly glow when it catches the light. Through Nelson's keen ingenuity and masterful craftsmanship, the ring looks perfectly timeless—as easily a relic of an ancient era as it is a glamorous contemporary accessory. Handmade in Maryland. Visit our blog to learn more about how Nancy Nelson uses found organic objects to create nature-inspired jewelry. Clean with a polishing cloth. Keep in an air tight bag or jewelry box to prevent tarnish when not wearing. I wear this ring when I'm having a rough day. It always cheers me up & reminds me carpe diem. I wanted to love this ring, but unfortunately it is a piece of junk. The stone came off completely after less than one hour of light wear. Sending it back. I liked that this ring was unique and I was really excited to receive it. However in person it wasn't as nice as I thought. Needless to say I was disappointed and returned the ring. Sent it to my girlfriend as a birthday gift and she loves it. The ring was of superb quality and visually striking. I can't think of a single bad thing about it. I would buy it again and again but she would probably question my sanity. The ring was beautiful and seems well made. It does run very true to size, which was disappointing because of all the reviews stating it was too large. I should have gone with a larger size and trusted the company.